Research in Practice Series | Everyday Learning Series | Every Child magazine | Australasian Journal of Early Childhood. The Research in Practice Series is a practical, easy-to-read resource, offering effective new approaches for those challenging issues which arise in the care and education of young children. These books are an essential resource for those involved in the early childhood field, containing content which is both idea-rich and to-the-point. For practical advice from early childhood experts and practitioners, subscribe to the Research in Practice Series today. Aimed at early childhood educators, students of early education, beginning practitioners, parents, grandparents and carers, the Everyday Learning Series provides wonderful suggestions about how to create positive learning environments for young children. The books draw upon the endless possibilities offered by everyday experiences. By ‘making the ordinary extraordinary’, the Everyday Learning Series is an invaluable resource for parents and carers of young children. The Everyday Learning Series focuses attention on the everyday ways in which young children—babies, toddlers, pre-schoolers—can be supported in their growth and development. Subscribe to the Everyday Learning Series today. Do you want to know what is happening in the early childhood sector? Discover the latest news and developments from the early childhood field in this bright and engaging quarterly magazine. 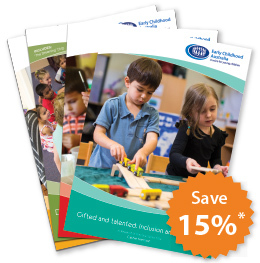 A popular option for services and individuals alike, Every Child features articles written by the sector, for the sector. Informative articles cover a range of topics including education, health, professional development, technology, sustainability, reconciliation, ethics and more. Every Child also includes guest statements and profiles from well-known identities in the sector and regular snapshots of early childhood services across Australia. Subscribe to the Every Child magazine today. 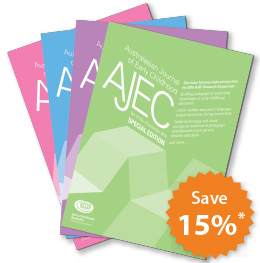 The Australasian Journal of Early Childhood (AJEC) is Australasia’s foremost scholarly journal and the world’s longest-running major journal within the early childhood field. Published quarterly, AJEC offers evidence-based articles that are designed to impart new information and encourage the critical exchange of ideas among early childhood practitioners, academics and students in the early childhood field. 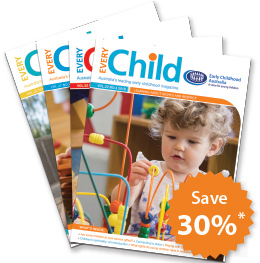 To become a subscriber please email customerservice@earlychildhood.org.au. Subscribe to ECA’s publications today to ensure you don’t miss any future issues!